According to a study, 56% of customers find print marketing to be one of the most trustworthy types of marketing. In a tech-savvy world, print continues to be one of the most powerful and cost-effective ways to promote a business, nonprofit event, product or service. Whether you are an experienced graphic designer, marketing agency, or a small business owner, it’s important to make sure your products are printed in the highest quality possible. 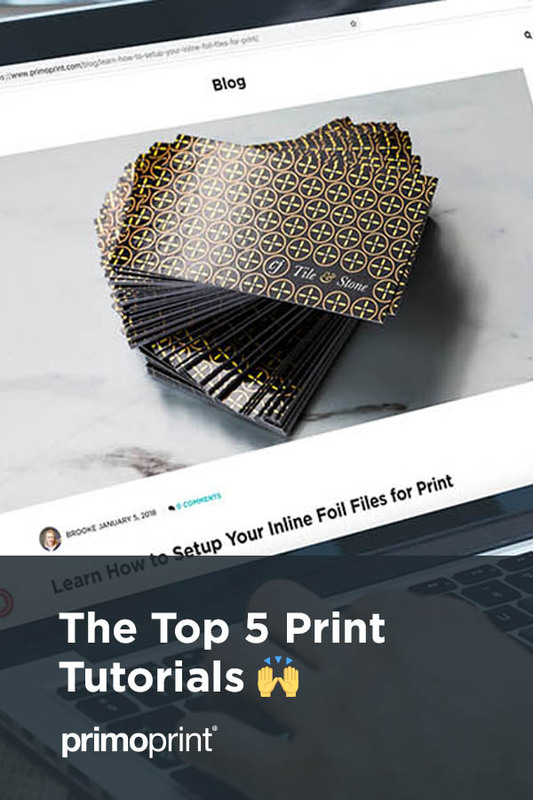 Below are our most popular print tutorial blogs to help get you started and avoid common print errors. What is Our Suggested CMYK Rich Black Build? When trying to print achieve a true dark black on your marketing materials, our designers suggest using C60, M40, Y40, K100. This CMYK configuration results in a darker tone than 100% black (C0, M0, Y0, K100). Learn more about rich black and why some frequently used black builds are not recommended. Adding Spot UV or Foil to your design is a great way to enhance your business cards and other print products. Learn how to correctly set up your files with ease and be sure to check out our mask file video tutorial. We all share the same fear of having our print project not turn out the way we intended. Incorrect file preparation is generally the number one cuprite. Brooke, our Design Team Director, created a list with five common print mistakes and discussed how to avoid them. Each error is easy to make, but easy to fix. Inline Foil is a popular choice when you want to add metallic shine to your business cards, postcards, and other marketing materials. With Inline Foil, you can add unlimited foil colors to your design. Learn the proper procedure to set up your files for the best results. We offer “certified templates” that guarantee proper, speedy, and accurate production of your print products. This business card template tutorial is an in-depth video explaining the proper dimensions including bleed, safe area, and CMYK color mode. The template tutorial is for our business card templates, but we do provide downloadable templates for all our products. We’ll continue to update our blog with useful and educational content. Want to stay up-to-date with our blogs? Click on the bell icon located at the bottom left of this page and accept to allow notifications from Primoprint. Do you have a suggestion for our next print tutorial? Comment below, and we’ll see what we can do.